I spend a lot of time in my home office. 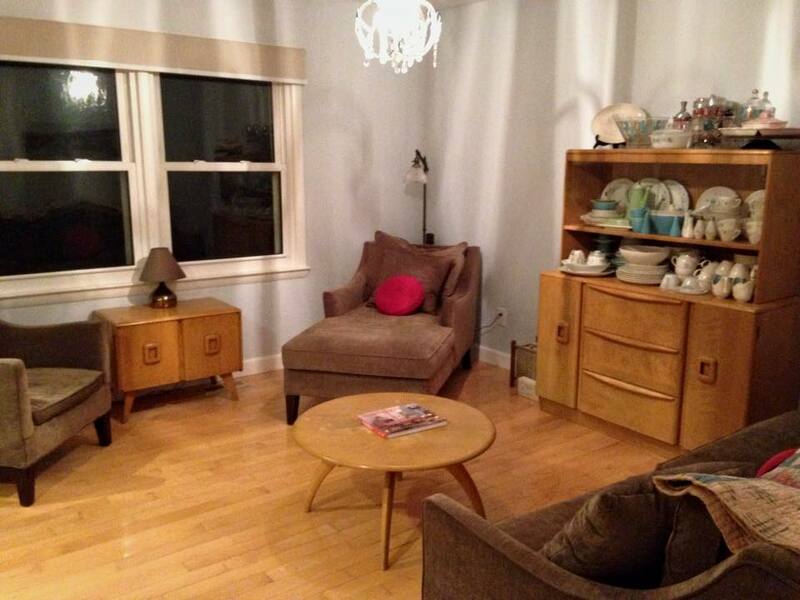 Here, I sell vintage items online, research auctions and estate sales, pay bills and file papers, print shipping labels and package shipments, and obsessively search Craigslist ads for dish patterns I collect, a 1950’s GE ‘Wonder Kitchen’, and used Heywood Wakefield blonde modern furniture. 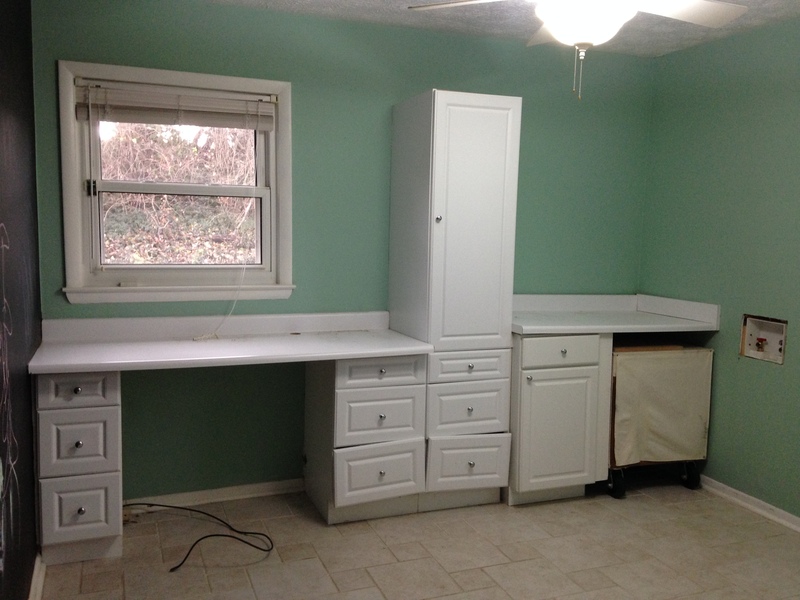 1990’s Pre-Fab cabinets and counter tops…yuck! This old shelf was great to store shipping supplies and the counter top was a nice place to prep shipments, but it had to go. 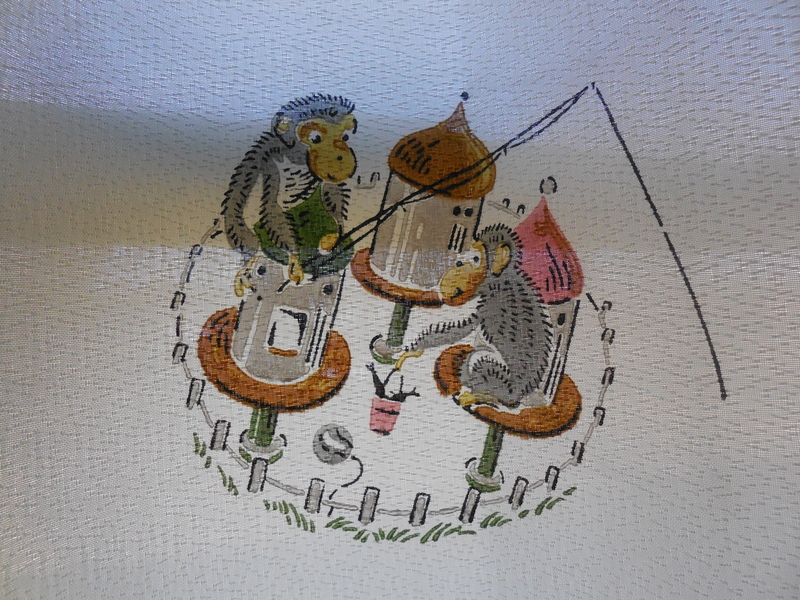 I transferred it to the basement laundry room where I fold clothes on it and store large bulky blankets in the shelves. 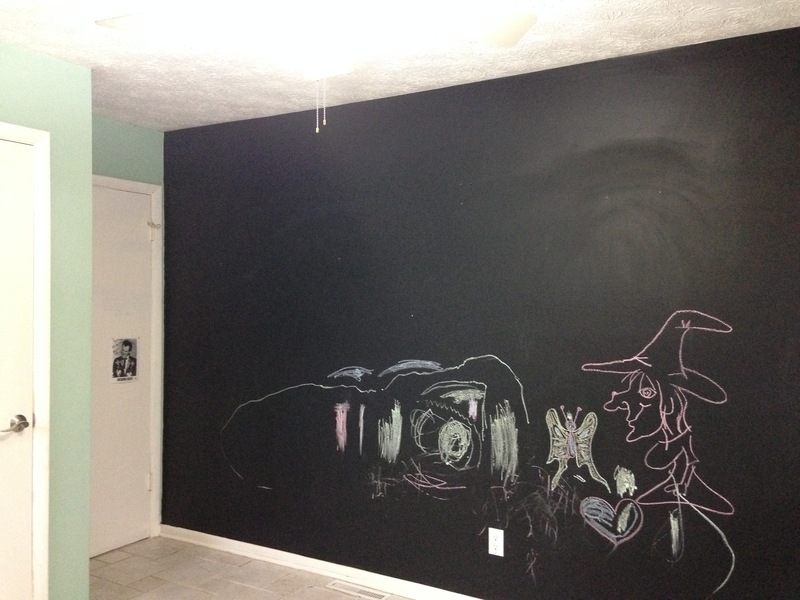 Yes, we had a chalkboard wall, which my toddler nieces loved, as you can see, but it created a lot of dust and never, ever seemed clean, no matter what I washed it with. (Yes, that is Chaddy Daddy’s autographed picture of Unknown Hinson on the back of the office door. This pic made my niece cry, so it had to go too :)). So, with Chaddy Daddy’s help, the demolition began. 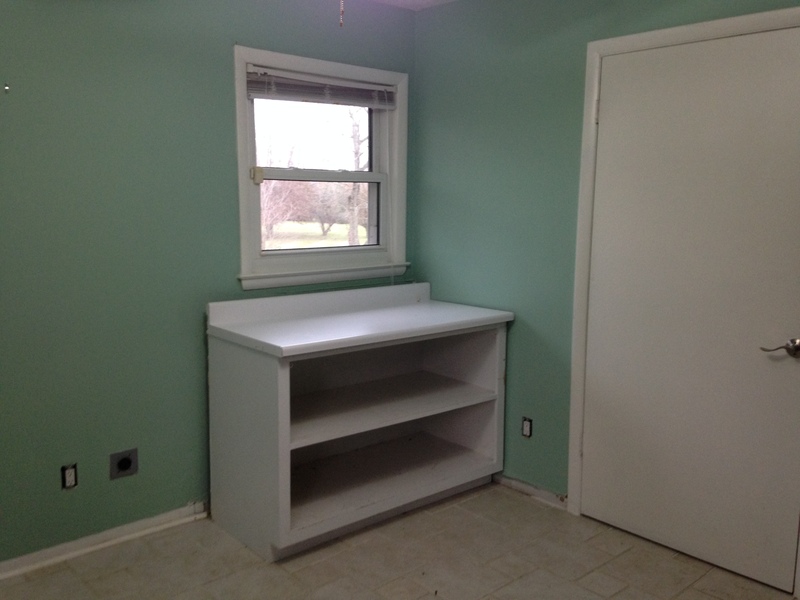 We removed the pre-fab cabinets, skimmed the walls, painted, and had the tile professionally cleaned. Thank you Stanley Steemer! 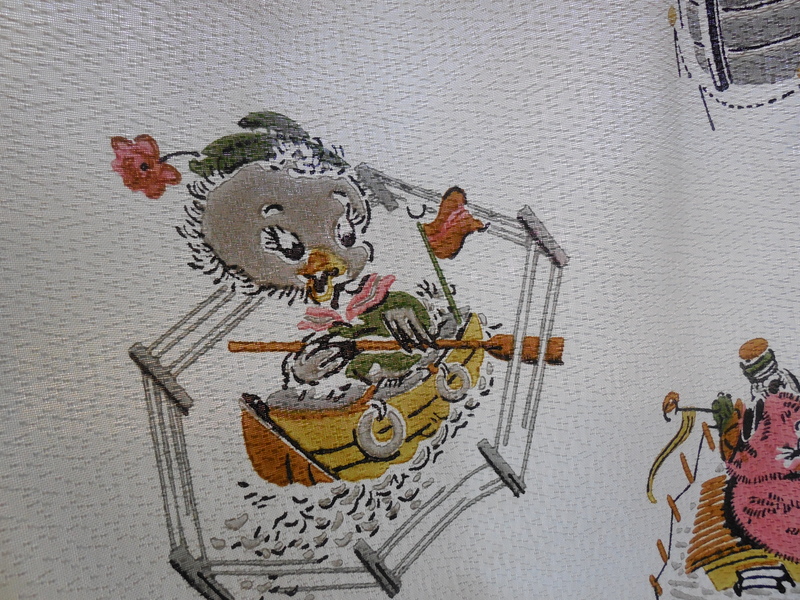 Next, we moved in the Heywood Wakefield furniture…. 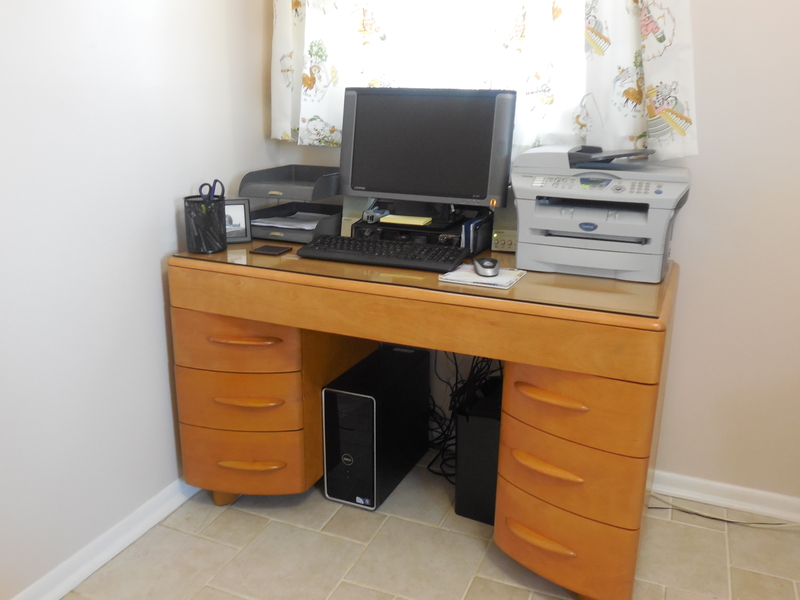 My new / old desk was won at an auction in Warsaw, KY. 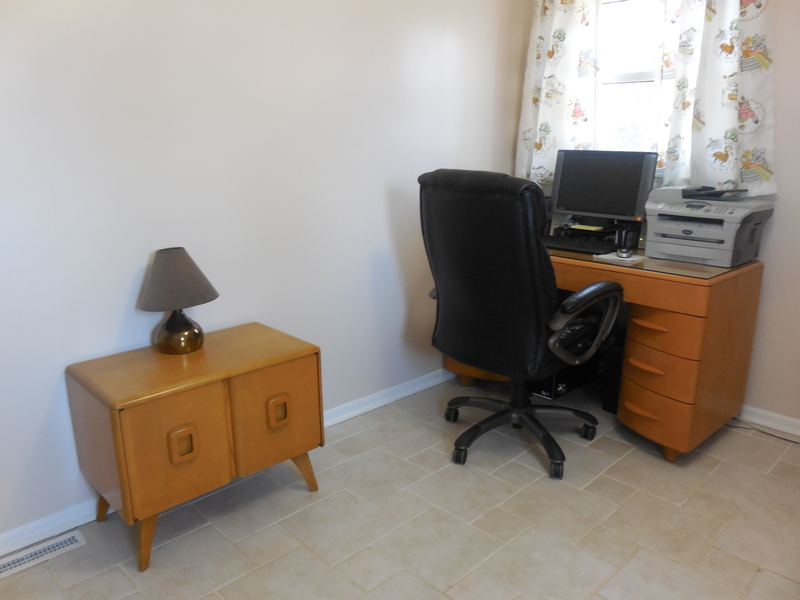 It is a knee hole desk in Wheat with the original glass covering the top, so this beauty was pristine despite her age. 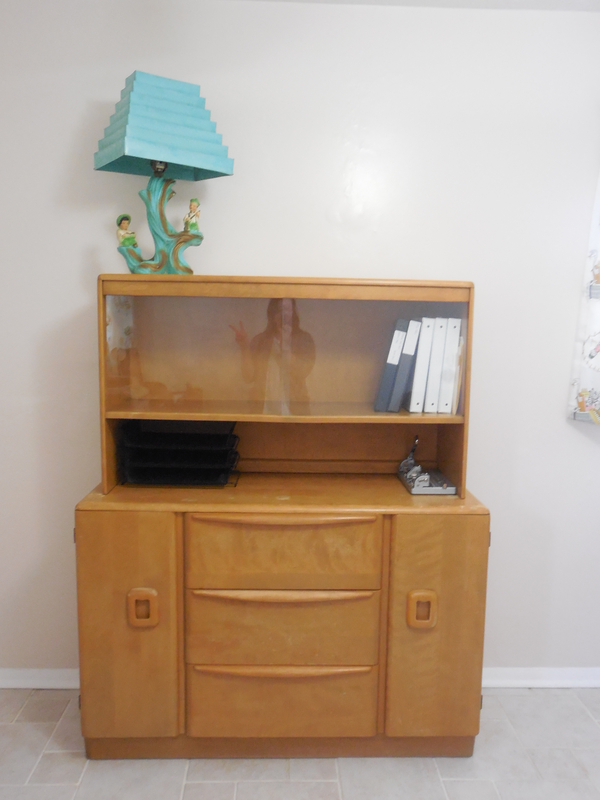 The china hutch that was once in the sitting room now serves as a cabinet for files and holds office supplies. 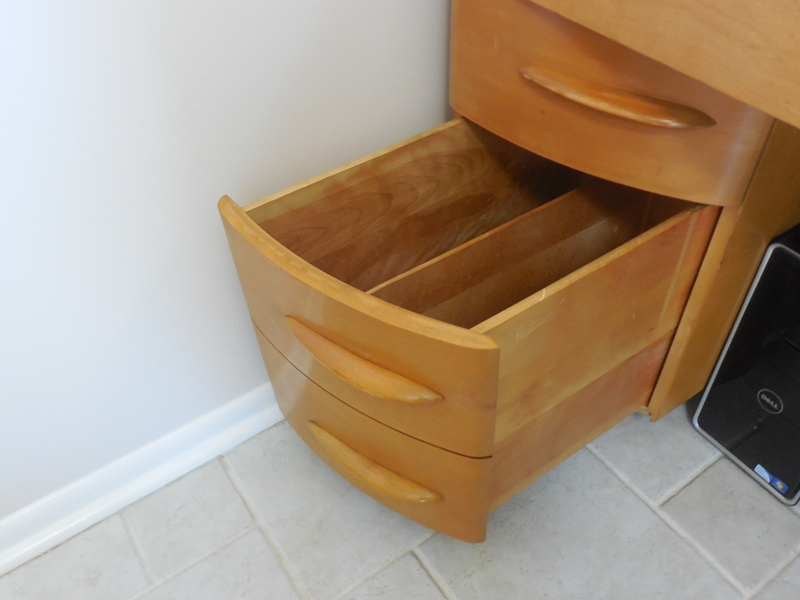 The two lower left hand drawers are really one large filing cabinet. 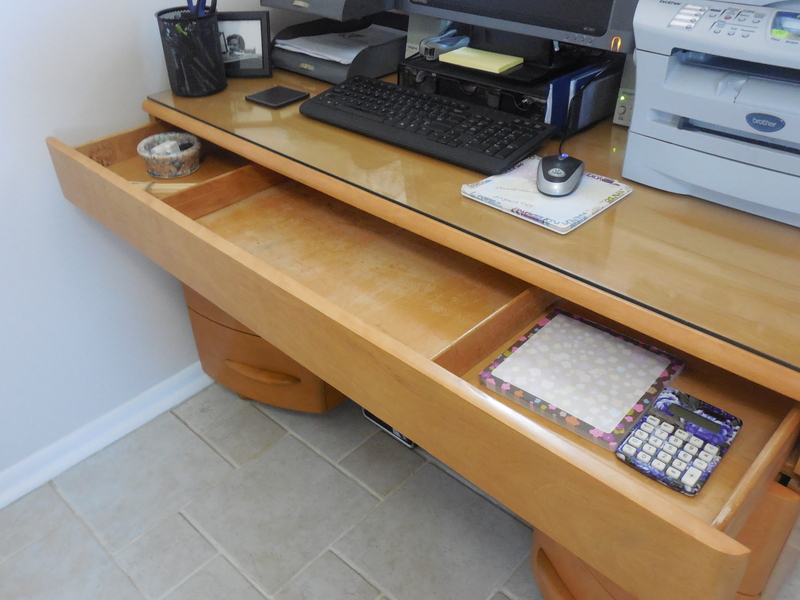 …and the top drawer extends the length of the entire desk and can hold it all! This Hey-Wake side table is space-age cool! I hide my laptop in its cubby for storage and charging. The little Hey-Wake record cabinet holds magazines and books, just like it did when it was in our sitting room. 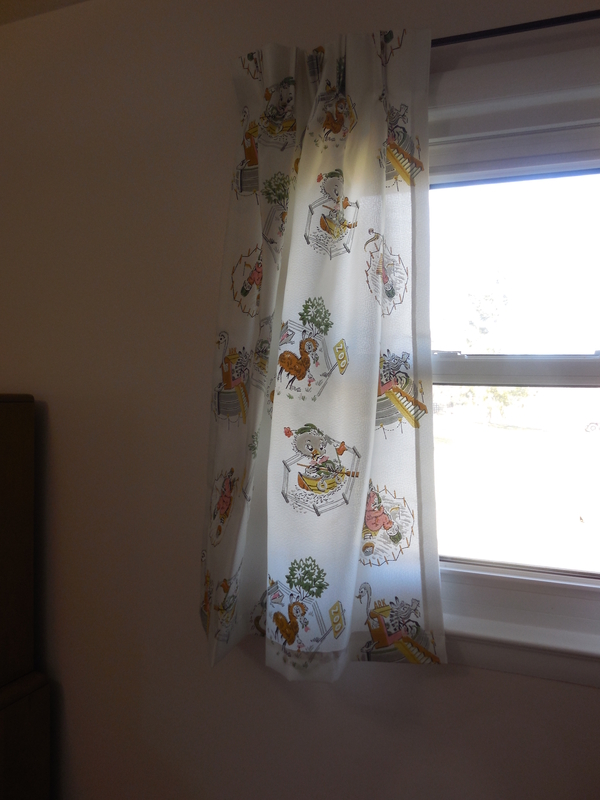 I found these “new old stock” fiberglass children’s curtains on eBay and fell in love with them. They matched the wall paint well and made me happy. 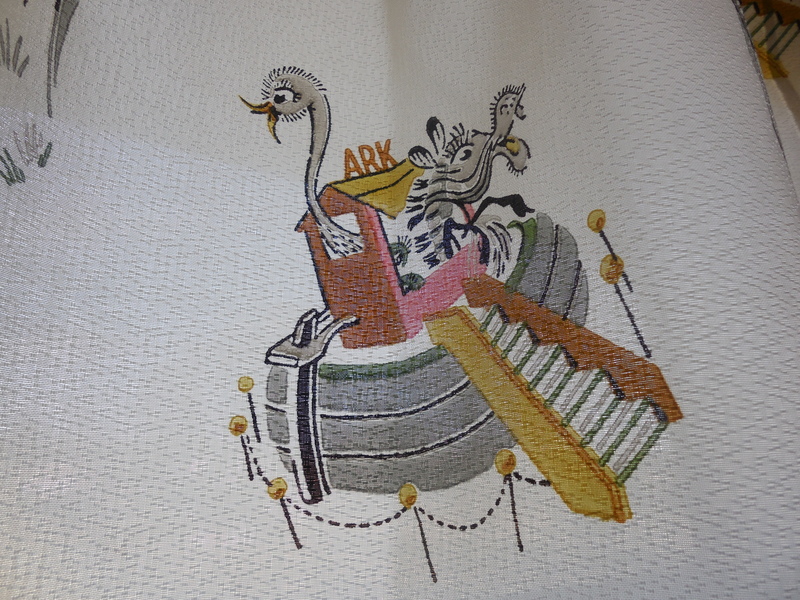 Plus, I figured the nieces would like them as well with the adorable baby animals – monkeys fishing, duckies boating, and lots of others hanging out of an ark! This is the old sitting room currently in transition back to a formal Heywood Wakefield dining room. 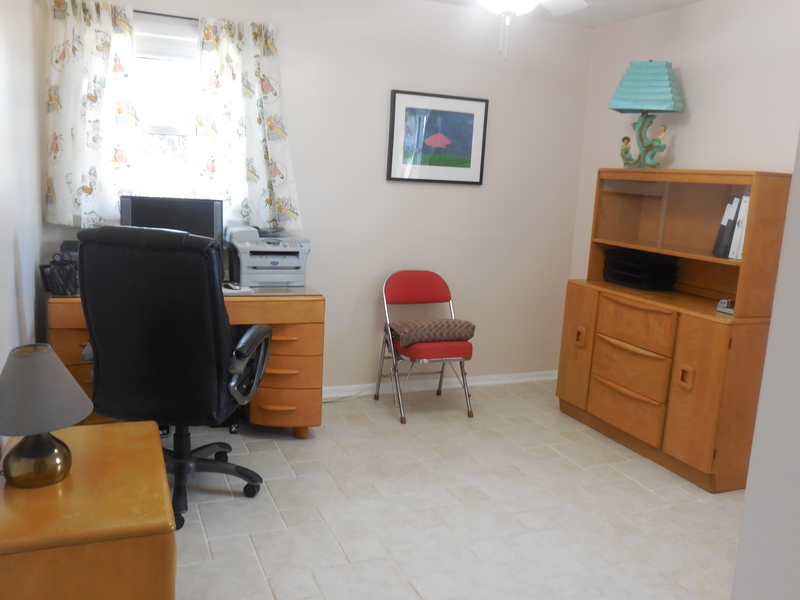 The china hutch and record cabinet have been moved to the office for new purpose. 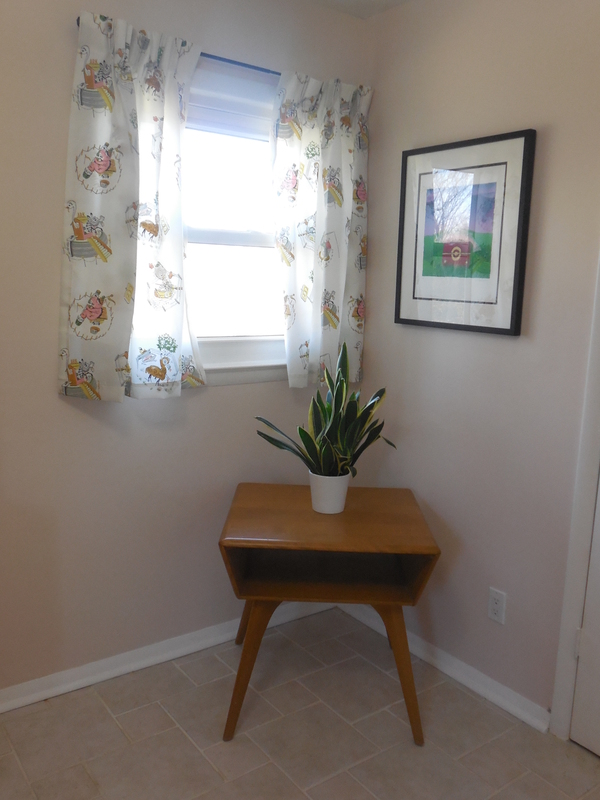 So in a past post, I wrote about how Chaddy Daddy and I acquired some awesome, well-loved vintage Heywood Wakefield pieces, one being a china hutch. Currently, Chaddy Daddy is refinishing the Mr. & Mrs. Dresser for me as part of the on-going Heywood Wakefield Bedroom Makeover, which is still a work in progress. 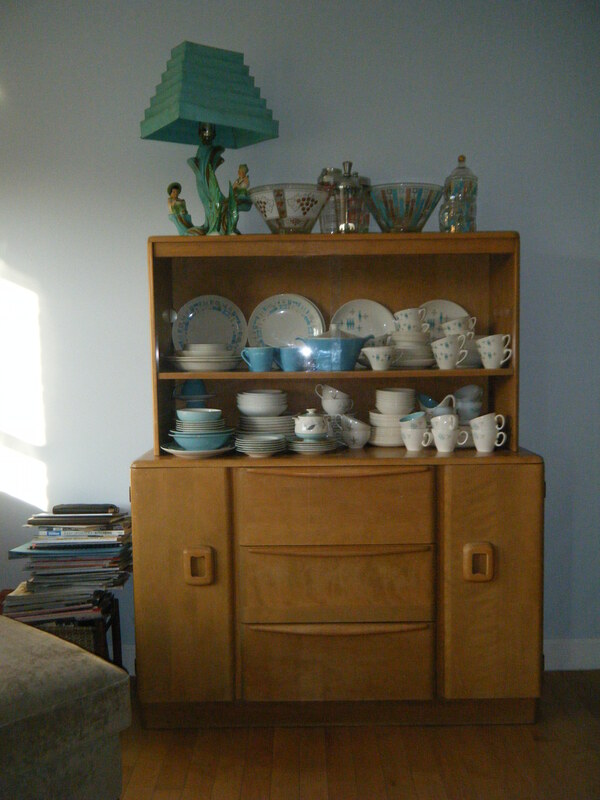 In the meantime, I set up the china hutch in our sitting room and FILLED it with all my lovely retro dishes. Take a look! 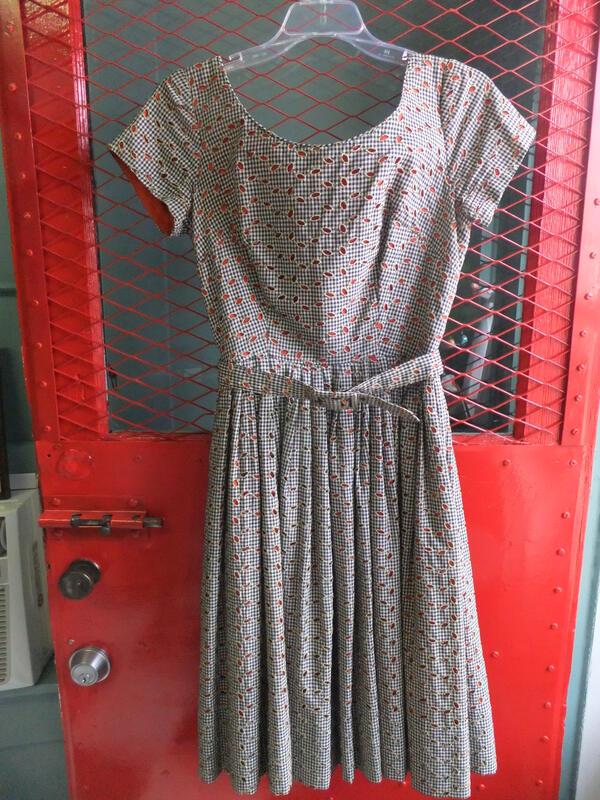 This is a lovely 1950’s day dress in excellent condition. Although not sized, it runs on the small side with an estimated 26″ – 28″ waist.